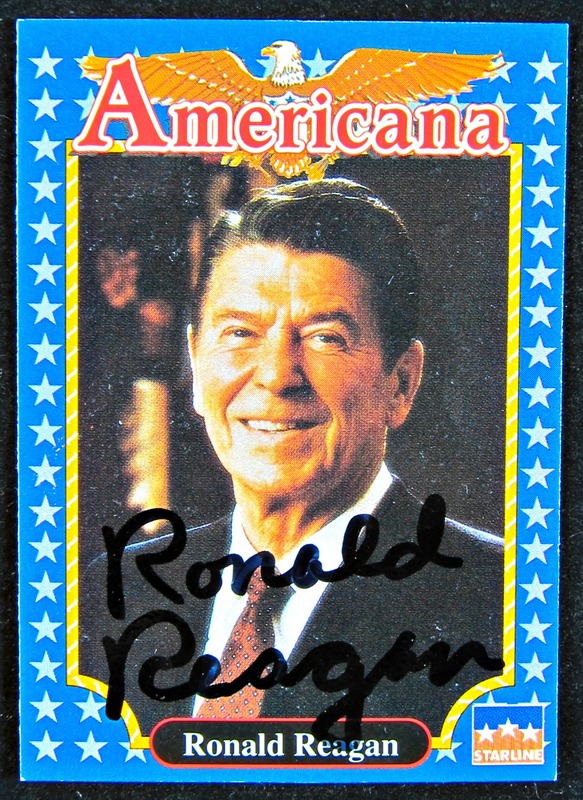 Starline Americana autographed Ronald Reagan #83 card. The card comes with Letter of Authenticity Memorabilia Center. Ronald Wilson Reagan (February 6, 1911 – June 5, 2004) was an American politician and actor who was the 40th President of the United States, from 1981 to 1989. Before his presidency, he was the 33rd Governor of California, from 1967 to 1975, after a career as a Hollywood actor and union leader. 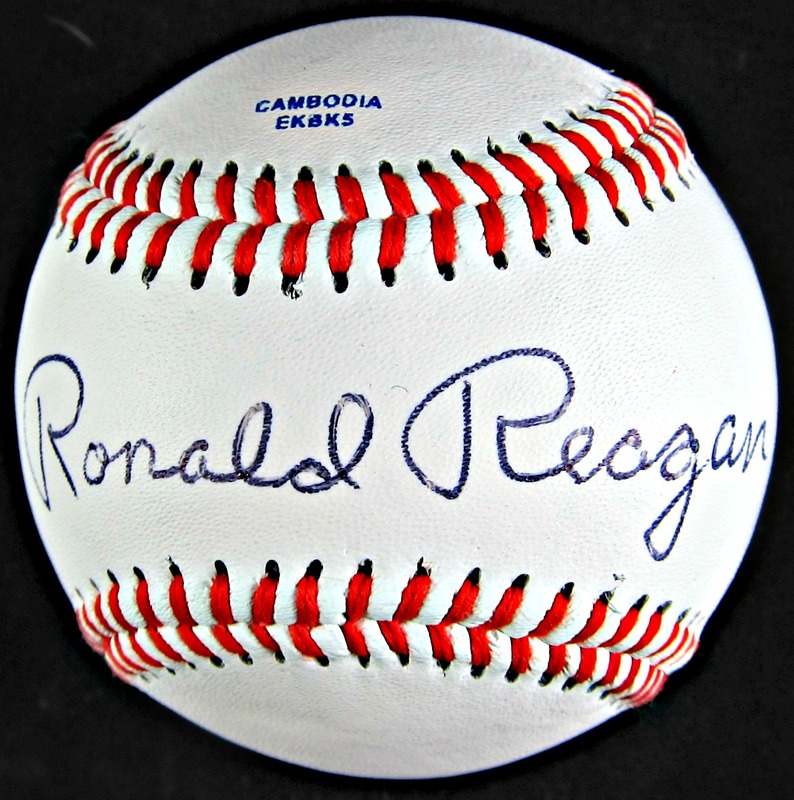 Raised in a poor family in small towns in northern Illinois, Ronald Reagan graduated from Eureka College in 1932 and worked as a sports announcer on several regional radio stations. After moving to Hollywood in 1937, he became an actor and starred in a few major productions. Reagan was twice elected President of the Screen Actors Guild, the labor union for actors, where he worked to root out Communist influence. In the 1950s, he moved into television and was a motivational speaker at General Electric factories. Having been a lifelong Democrat, his views changed. He became a conservative and in 1962 switched to the Republican Party. In 1964, Reagan’s speech, “A Time for Choosing”, in support of Barry Goldwater’s foundering presidential campaign, earned him national attention as a new conservative spokesman. Building a network of supporters, he was elected Governor of California in 1966. As governor, Reagan raised taxes, turned a state budget deficit to a surplus, challenged the protesters at the University of California, ordered National Guard troops in during a period of protest movements in 1969, and was re-elected in 1970. He twice ran unsuccessfully for the Republican nomination for the U.S. presidency in 1968 and 1976; four years later, he easily won the nomination outright, becoming the oldest elected President up to that time, defeating incumbent Jimmy Carter in 1980. Entering the presidency in 1981, Reagan implemented sweeping new political and economic initiatives. His supply-side economic policies, dubbed “Reaganomics”, advocated tax rate reduction to spur economic growth, control of the money supply to curb inflation, economic deregulation, and reduction in government spending. In his first term, he survived an assassination attempt, spurred the War on Drugs, and fought public sector labor. Over his two terms, the economy saw a reduction of inflation from 12.5% to 4.4%, and an average annual growth of real GDP of 3.4; while Reagan did enact cuts in domestic discretionary spending, increased military spending contributed to increased federal outlays overall, even after adjustment for inflation. During his re-election bid, Reagan campaigned on the notion that it was “Morning in America”, winning a landslide in 1984 with the largest electoral college victory in history. 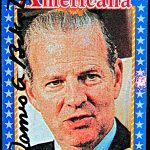 Foreign affairs dominated his second term, including the ending of the Cold War, the bombing of Libya, and the Iran–Contra affair. Publicly describing the Soviet Union as an “evil empire”, he transitioned Cold War policy from détente to rollback, by escalating an arms race with the USSR while engaging in talks with Soviet General Secretary Mikhail Gorbachev, which culminated in the INF Treaty, shrinking both countries’ nuclear arsenals. During his famous speech at the Brandenburg Gate, President Reagan challenged Gorbachev to “tear down this wall!”. Five months after the end of his term, the Berlin Wall fell, and on December 26, 1991, nearly three years after he left office, the Soviet Union collapsed. Leaving office in 1989, Reagan held an approval rating of 68 percent, matching those of Franklin D. Roosevelt, and later Bill Clinton, as the highest ratings for departing presidents in the modern era. He was the first president since Dwight D. Eisenhower to serve two full terms, after a succession of five prior presidents failed to do so. While having planned an active post-presidency, in 1994 Reagan disclosed his diagnosis with Alzheimer’s disease earlier that year, appearing publicly for the last time at the funeral of Richard Nixon; he died ten years later in 2004 at the age of 93. An icon among Republicans, he is viewed favorably in historian rankings of U.S. presidents, and his tenure constituted a realignment toward conservative policies in the United States.